It has been said that 70 percent of purchase decisions are made in-store. This surprising figure raises the question of how to best influence consumers who are making purchase decisions in-store. Support for the 70 Percent Rule is based upon a 1995 study initiated by Point-of-Purchase Advertising International. Independent studies confirm that the majority of purchase decisions are, in fact, made in-store, but not as much as 70 percent. In an academic study conducted in 1967, it was found that 50.5 percent of in-store purchase decisions were unplanned. A later study, conducted in 1998, concluded that 59.1 percent of store purchases were unplanned. Thus, it has been demonstrated that 50 to 60 percent of in-store purchases are spontaneous. 1. Exposure to Categories and Displays: This is impacted by the trip type, number of aisles shopped, display type, and location and purchase involvement. 2. Motivation to Process In-store Stimuli: This includes deal proneness, age and the need for cognition—that is, the influence of a message on a consumer’s decision-making process. 3. Planning: This is the use of a shopping list, shopping trips per week and deal proneness. 4. Need Recognition: This includes compulsiveness, gender, household size, shopping party size and income. Considering this process supports the decision by retailers and brands to invest in digital signage because digital signage is unique in its ability to leverage many of the in-store elements that factor into targeted messages to convert shoppers into buyers. Stated another way, digital signage content can easily be geared to impact those factors found to have the most effect on consumer in-store decision-making. For instance, the above-noted study found that the most important influence on in-store purchase decisions was the number of aisles shopped. Thus, creative content geared toward encouraging consumers to visit more parts of the store can increase retail sales. An ad that introduces, “Buy peanut butter here and get 50-percent off jelly on aisle 21,” may be an effective way to augment the number of aisles shopped. If this content does not produce the desired result, it can easily and quickly be altered to find the most effective messages. Another important in-store medium was not considered in the noted research: mobile devices. According to its third quarter 2011 Insights Report, JiWire found that 18 percent of shoppers use their mobile devices to make purchases when inside a store, and 28 percent comparison shop on mobile devices when in a store. 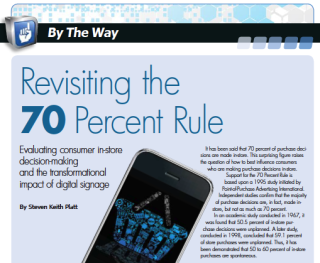 The conclusions of the WSL/Strategic “Retail Buzz to Buy 2.0” trend report were more aggressive, finding that as many as 50 percent of smartphone owners use the devices when shopping in-store for comparing prices (56 percent), taking pictures of products (53 percent), and finding coupons and discounts (46 percent). While digital signage and mobile messages cannot affect all factors that impact in-store purchases, such as household size, creative content can have an influence on many other factors. Both brands and retailers can benefit from such a content focus. A more detailed article on this topic can be purchased from the PRI Resource Library by visiting http://www.plattretailinstitute.org/Library.